Eagles International Forum • View topic - A bit of road time. . .
A bit of road time. . . So, Cindy and I are getting ready for Stagecoach Country Music Festival this weekend--hopefully it's a nice long (Thursday-Monday) weekend. 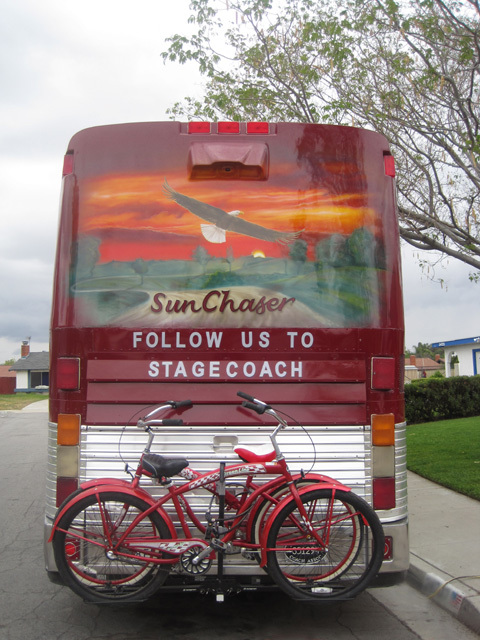 And who knows, we might even run across Joey & Rory and their Eagle bus! A good time is usually had by all--last year there were about 50,000 in attendance and only one other bus. . .maybe we'll run across some more this year. Once we get back, we'll be heading out to Kingman area to visit a couple of neighbors who moved outta the rat race. That'll be a short weekend (Friday-Sunday). . .sort of a reunion with the King of the Hill neighborhood folks that helped build this animal. All-in-all, not a whole bunch of miles--but any miles are good miles until I pull the retirement plug at the end of the year. In fact, Quartzsite next year will probably be our first trip in retirement! Re: A bit of road time. . . Sounds like a lot of fun. Have a safe trip. At least you get to go out and make some smoke! Dang! Is that this weekend? I found out from Merle's road manager that my Hag staff passes are not good. No surprise. They usually aren't on big events like that. Hopefully he can get me some passes like Charlie did last year but I won't know till they get there. Hopefully we'll be seeing ya'll down there. We'll be looking forward to seeing you guys if you can make it. . .we'll be getting there tomorrow (Thursday) night and hanging through Monday morning. . .the ol' Hag is on at 7:00 Saturday night, opposite Billy Currington and Sugarland on the main stage--I wish they wouldn't do that! Same plan as last year--give a call on Cindy's cell if you get close by. . .we'll be in the same general area as before. Ok, we're fired up and ready to roll! wish the rest of y'all were going too! Maybe next year because I would like to go, have a nice trip! busdriver58 wrote: Maybe next year because I would like to go, have a nice trip! Maybe we can meet you there sometime! OK, my passes are all set. I'll be there in time to see Joey+Rory and then stay to see Merle and Ray Price. Then I'll probably head on back home. Looks like I might be coming by myself this year.